Workforce as a Service – Is WaaS coming anytime soon? I just came across this very interesting presentation from Mary Meeker, a former Wall Street analyst and now partner at venture capital firm Kleiner Perkin. This 88-slide behemoth contains a lot of market data about the growth of mobile technology. More interesting, it asks a lot of questions about how this technology will continue to transform the way we live. It won’t be surprising to many reading this post that retail, banking, book publishing, music distribution, entertainment, and many other businesses have already been radically transformed by the emergence of visionary disrupters who saw the opportunity presented by the internet beginning over 20 years ago. From Berners-Lee to Bezos to Jobs to Zuckerberg, the notion of an information superhighway has morphed from Star Trek fantasy to assumed convenience. (This may be urban legend, but I read somewhere once (though can’t find it on the googlemachine today) that the inventor of the first cellphone was inspired by Star Trek. 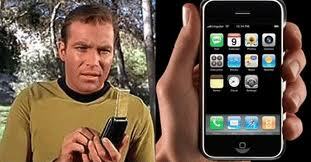 Whether it’s true or not, I’m using the picture here because my 45-year crush on Captain Kirk remains unabated). Check out slide #74. The supposition here seems to be that we are on the cusp of Workforce as a Service (WaaS). I haven’t heard that particular term before, but the notion of the internet-enabled freelance economy has been around at least since the 90’s when I first heard it. The idea is that those with skills that are in high demand can sell those skills in the open market on a temporary basis, rather than tying themselves down to a single employer. In 1999, when unemployment was 4.2% and employers were handing out BMW’s as signing bonuses, the idea of the freelance economy looked pretty attractive. In 2012, according to the Freelancers Union, nearly one in three or 42 million Americans is an independent worker. I suspect that number is driven as much by unemployment, under-employment, and employer strategies to manage expenses as it is by worker preference. On the other hand, the infrastructure to support telework also makes freelancing more feasible. What do you think about WaaS? Is this increasingly the wave of the future? Has the Freelance Revolution Arrived in Your Workplace?